Is There a Sansar News Source? Yes. There is. Unfortunately, it is in the Sansar Forum, which is pretty lame and has no RSS feed which Feedly can find. There are some follow buttons on the Sansar Forum site now. You must be logged in for them to appear (work?). So, I suppose it is an email thing. I’m finding out. The meetings are held on various days. The most recent meetings were Friday (11th) and Monday (14th) with Friday’s meeting at Drax’s place 114 Harvest (URL) at 9:30 AM PT and 4:00 PM PT and Monday’s meeting at Strange Lights at 3:00 PM PT. Watch the official ‘Sansar Meet Ups’ schedule here. In Second Life, the use of meeting transcripts has been and is decreasing. The Content Creation UG meeting is in voice. Medhue and I video the meetings (no CC UG meeting this week or next) and post them to YouTube. Rex Cronon, a resident, used to create a transcript of the Server-Scripting UG meeting. The Server Beta group published transcripts of their meetings until mid-June then stopped. The Sansar UG Meet Up processes their meetings into summary reports. The raw transcript doesn’t appear anywhere that I have seen. 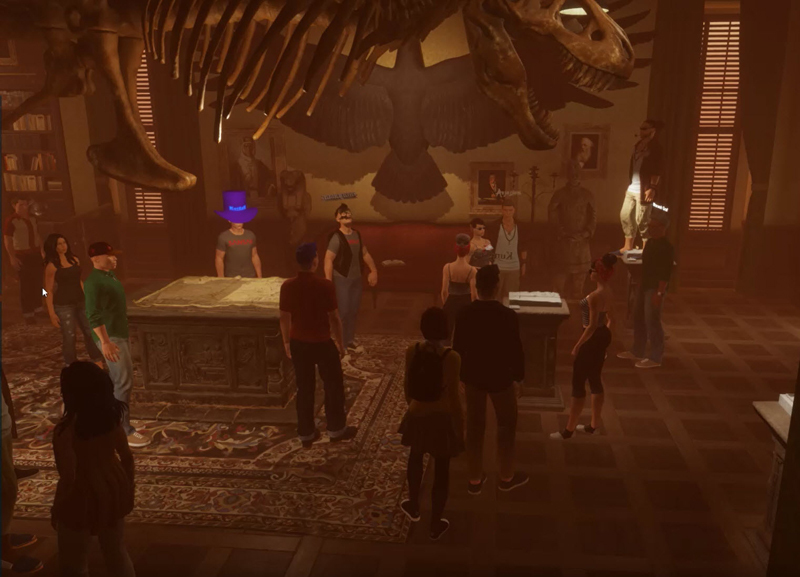 An example is the Sansar August 4th meeting summary. It is the most recent available today. How would one accommodate an auction? Is there a way for the auctioneer to be in all the copies of the experience to run the auction? Can the auctioneer see all the people in all the copies? Probably not. I suppose he might be able to hear them all. Chat in an experience might be like SL group chat where regardless of where one is they can talk with the group. That 40-person limit seems to be the current technology limit regardless of the game… well for those MMO’s where people are interacting. There are exceptions. Eve Online is an example. It goes way over 40 but it has horrendous lag. There is no ETA for Mac support. The lack of VR support for Apple products BY APPLE is eliminating Apple from the VR world. Social features (chat-voice) are in development. An interim measure is a Discord server is being brought online for connection across all experiences. No ETA. Animation import is coming ‘really soon’. Terrain editing is in testing, the tweaking stage. Coming ‘really, really soon’. The Sansar marketplace (referred to as ‘the store’) is in development. Ways to search, sort, and filter are being added. It looks like text chat is going to be made available for those using a VR headset. I’m into politics, so some of the answers sound very smoothly evasive. There is a request for a progress bar for the experience loading process. Also, for an experience size indicator for those with data limits. The ideas have been accepted into the feature request list to be considered. Search is coming to the Atlas, soon. For now, use the browser’s FIND on Page. Video tutorials by Linden Lab are coming. No ETA. For now, watch Strawberry’s video. There are also various SL blogs and I suppose some new blogs that are covering Sansar. Massively is NOT covering Sansar. Massively has only published 3 articles in the past year… But basically, it is all the usual suspects. Wasn’t trying too…didn’t know if this was the same site you were referring too or not. You could have clicked… But, no problem.